HE game of golf of yesteryear was more about finesse and feel than power. Up until the late 1800's, each elegant and graceful play club (or long nose club) had its own personality. The available technology and the ball itself dictated the style of the golf club. Featherie balls were used for centuries. Constructed using three pieces of leather sewn together and then stuffed with a top hat full of moist down feathers, the balls were relatively soft and the contact was sweet and mellifluous compared to the firm gutta percha balls that followed. 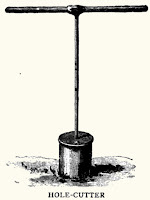 In 1850, gutta percha balls, made from the sap of the Malaysian palaquium tree, were introduced. These balls were distinctively harder and took their toll on the featherie era wooden clubheads. Initially, some of the featherie clubheads were fitted with hardened leather inserts to lessen the damage to the clubface. Eventually, by the last two decades of the 19th century, the clubs morphed into clunkier and stouter renditions to accommodate the guttie ball. My two favorite hobbies, woodworking and golf, have collided. Over the last couple of months, I have attempted to replicate some long nose era golf clubs from the pre-1880 era. There are some very helpful sources of information on how these clubs were constructed. The Book of Golf and Golfers, by Horace Hutchinson. Very detailed 15 page explanation in a chapter by J. H. Taylor. Addendum: Had I known about Robert Gowland's The Oldest Clubs (2011) prior to embarking on golf clubmaking, many of my questions and many mysteries would have been readily answered. This book provides the most in depth information on early golf clubmaking that I have encountered. Being involved with the major auction houses, Mr. Gowland holds the distinction to have handled most, if not all, of the earliest golf clubs in existence and is, himself, a fine craftsmen of early clubs, both wooden and iron. In a way, I'm probably more fortunate to have discovered this book after first trying my own hand at clubmaking. After all, it is often the journey of discovery that engages us, rather than the final product. It was a joy to find out that many of "my own discoveries" were corroborated by this book. If you are at all interested in making replica 18th or 19th century clubs, The Oldest Clubs is a must. Clubhead: Beech preferred. Apple, pear or thorn wood were also suitable. Shaft: Straight grained hickory supplanted ash as the shaft material after the first quarter of the 18th century. Ram's horn for the sole's leading edge. 7 ply waxed linen thread. Sheepskin leather grip with wool underlisting. Lead (I opted to use a bismuth and tin alloy from a company called Rotometals for safety concerns) used for the weight in the rear of the clubhead. Charles Lees. 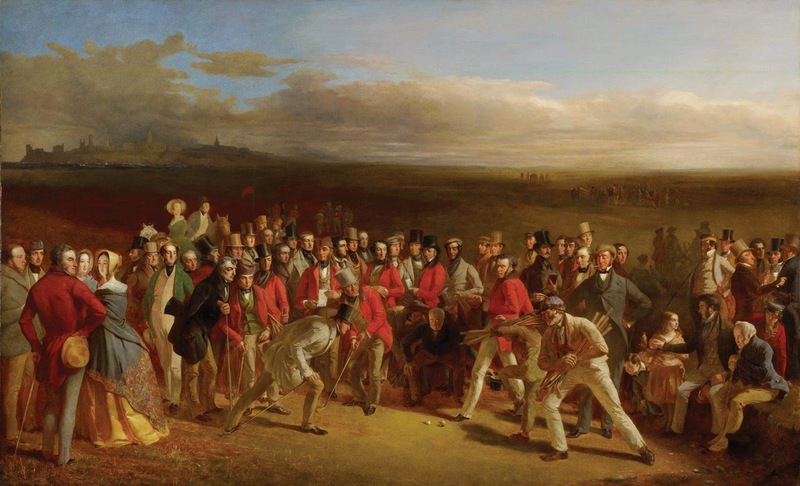 The Golfers, A Grand Match Played Over St. Andrews Links. I have a few original clubs from the 1800's and recently purchased replica clubs to use with the McIntyre synthetic gutty. I play hickory golf regularly but had always wanted to try pre-1900 golf. Unfortunately the synthetic balls were too hard and left dents in 2 of the club faces. I have been looking for articles on long nose club making and stumbled across your posts. I trained as a carpenter and joiner in a joinery shop finishing my apprenticeship in 1980. Fortunately for me I worked with older very skilled tradesmen who nearly always preferred to use hand tools over electric tools. I remember our electric drill was an old aluminium cased Black and Decker that had to be used with a separate safety box. Anyway at the time work was very scarce and after a couple of years I decided to go to University and study Science which took me away from carpentry and down what would become my current employment. I do a lot of club restoration and other jobs as needed around the house, its a trade that has served me well. So after reading your stories I am embarking on a similar journey albeit with the aim of producing clubs suitable for play. Luckily for me I live in Brisbane, Australia where I will have ready access to some of the hardest timber species in the world. I'm thinking probably ironbark at this stage. Did you use a pattern to mark out your club heads on the timber before cutting? I have seen original patterns sell at auction for large sums. Regarding a pattern, I made my own paper templates based on research at museums and by using Jeff Ellis' book, The Clubmakers Art. In the book, he gives dimensions of every club. cut out the block using the side view, then place the top view template on the roughed out block. Face thickness is about 1 inch. Width about 2 and7/8". Length 5-5.75". The book, The Book of Golf and Golfers is available free online. It has been my "bible" for technique. I have the link that you provided to the Hutchison book, great reading! Luckily I have the other books you have listed. Chapter 5 in the other David Stark book (Golf in the making) has some interesting insights into wooden club making, if you can get hold of a copy its a great book. It also gives some measurements of early clubs along with the angle of the shaft to the head. 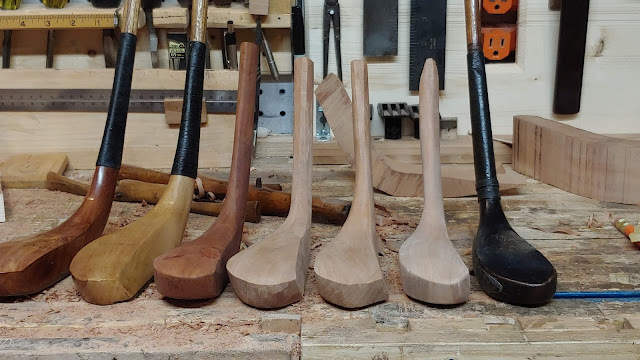 I have access to European Beech so I will give that a try along with the varieties of ironbark, as I mentioned my goal is to be able to use these clubs with the harder synthetic gutty balls so I need to make sure the timber I use is up to the task. Have you thought about maybe a mortice joint club as your next project? It's been tough trying to procure 10/4 beech save for some I have obtained from some logs. I also can't figure out where I can purchase gutta percha or synthetic gutta percha (balata?). If I recall, Stirk's book, Golf In The Making, listed the weight of the club (somewhere around 400g). If you have the other Stirk book, The Great Clubmakers, you'll find a trove of info on the subject of clubmaking. Have not gotten to the mortised (bridle or fork split) joint yet. Still stuck in the featherie era. Nice photo of a mid 19th century Philp/Forgan mortised club on page 147 in Golf In The Making. 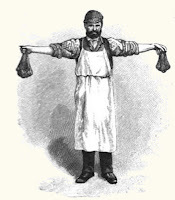 I had forgotten how early these were introduced (1850's). Jeff Ellis' book shows that this joint had a resurgence later in the 19th century. I've looked everywhere for gutta percha as well but to no avail. Chris McIntyre (McIntyre Golf) uses a synthetic material to make his replica playable gutta balls but I don't know whether he would divulge his material source. Im looking forward to having a go at a long nose. Is that a leather insert in one of your clubs? If so did you prepare that yourself? Growing your own Palaquium tree! Now that would be interesting. I saw this video on gutta percha manufacturing a while back. The video shows that they use the leaves to get the sap, rather than tapping the tree. I found some thick leather on ebay, boiled it down, pressed it for 3 days, and carefully cut away the material to fit. That club was the second one that I made and was frought with problems. I was trying to make a short baffy, so I filed back the face for more loft. Unfortunately, that exposed a peg that secures the horn. I was able to remove the wood to accommodate the leather insert without removing the horn, but this was time consuming. I used Chris McIntyre's technique for the most part. The grain direction was also off on that club. Plus, one of the drilled peg holes was too close to the neck. Out of curiosity, I hit a Titleist. The ball scurried about 120 yards, but the club cracked near the heel. It is now glued back together. I have hit a couple of shots with another club, and it held up, although I'm afraid of cracking it. I think it was in Hutchinson's book where he mentioned that pear wood, which is what I used, will either break on the first shot or last forever. Were you a football player? If so, my work colleague, who grew up in Adelaide, thinks he remembers watching you play. I did play some football at the senior level (rugby league) however it is not the predominant code in South Australia or Victoria (Australia's southern states) which is Australian Rules football (now called AFL) so I doubt I am the same person. I know that feeling of the club cracking all too well. I had the same urge albeit with an 1890 LH Forrester semi-long nose club. The saving grace was that I had 2-3 good clean hits that sent the ball rocketing down the fairway before it cracked, also near the heel. It was repaired with barely a sign of any damage so no real concern. It was delightful to hit such a long (45") club with a shaft so whippy it felt like it was made of rubber! I had to swing so slowly to allow the club head to catch up! It was one of my first tries at hickory golf and probably the moment that I was hooked!